Last year I thought I’d planted climbing French beans in the garden, and was later disappointed to find out that I’d sown a dwarf variety! 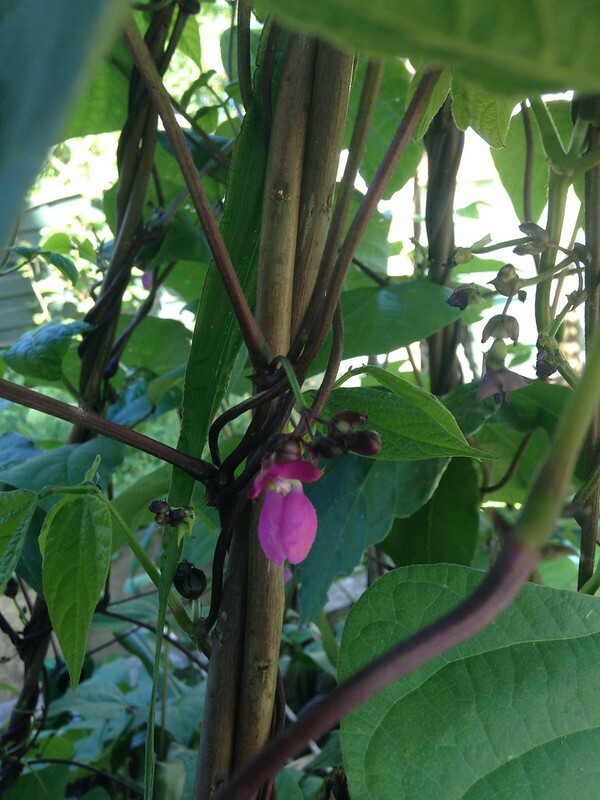 This year I rectified that issue and sowed two different climbing beans – Blauhilde and Helda at the beginning of June. I sowed some indoors and some directly into one of the raised beds, where my intention was that they would climb the sweetcorn (and be 2 of the 3 Sisters). That hasn’t worked out – for some reason the sweetcorn has been a complete failure, with most stems barely reach two feet tall. In the end I put up tripods for the beans instead, and they’re really getting going now. The two beans are very different. The one in the picture above is Helda, a bean that I have eaten in packets from the supermarket. I like Helda beans because they’re tasty, and they’re flatter than regular French beans – they look a bit more like runner beans, but they’re not at all stringy. So I thought I would try growing them myself. 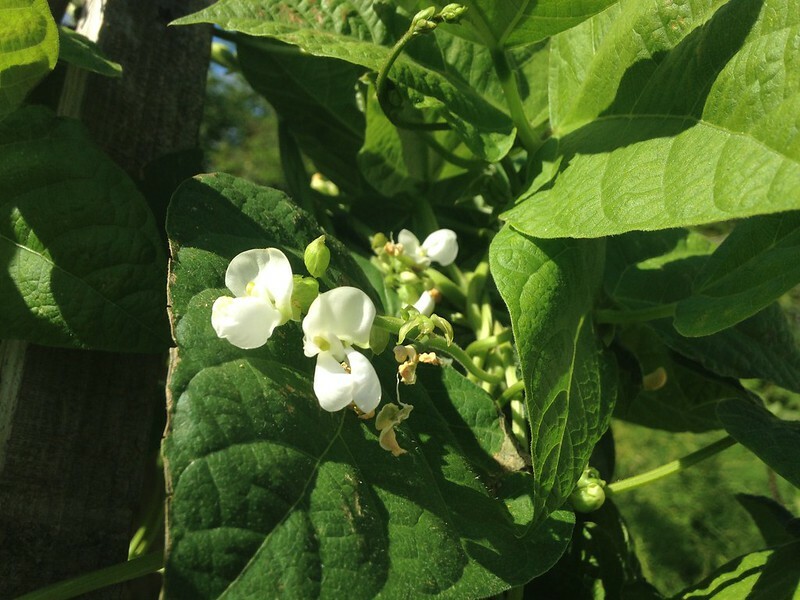 Helda has pretty white flowers, and grows green beans. 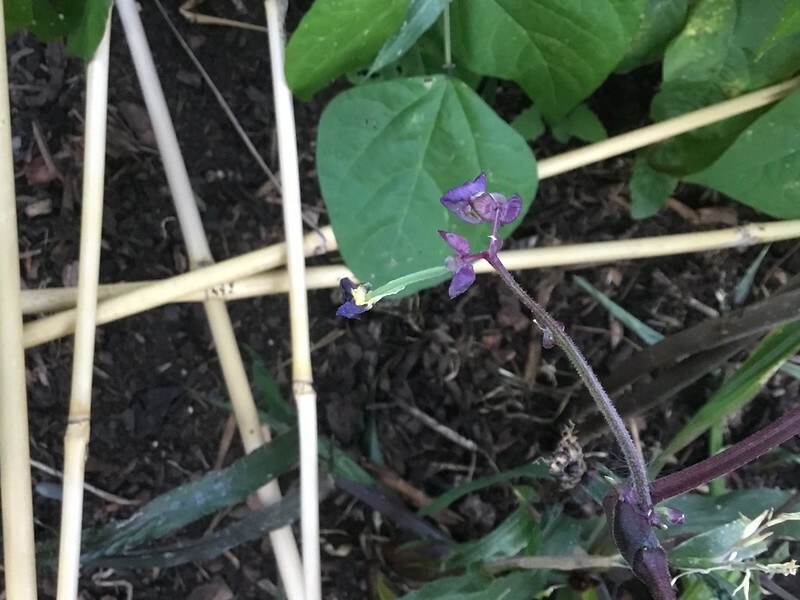 Blauhilde has purple stems, purple flowers and purple beans. The pods will be a more normal, rounded shape, and they should also not be stringy. There’s something quite endearing about baby beans! We are keeping them watered in this heat, although they cope better with it than runner beans do, which can stop producing beans when the weather is too hot/dry. The tripods did try and tip over in the strong winds we had a few days ago, but fortunately the plants weren’t damaged and we were able to right them all when the wind died down. So there’s every prospect of picking decent harvests of our own beans very soon now! These will be the first French beans we’ve grown in this garden, and as I really do like French beans, it’s very exciting. Earlier this year, I was sent a review copy of Easy Thai Cookbook by Sallie Morris, and we have been salivating over the recipes (although my cooking mojo has disappeared completely in the heat). The publisher has allowed me to share one particular recipe we’re really looking forward to trying, which will showcase our beany babies! 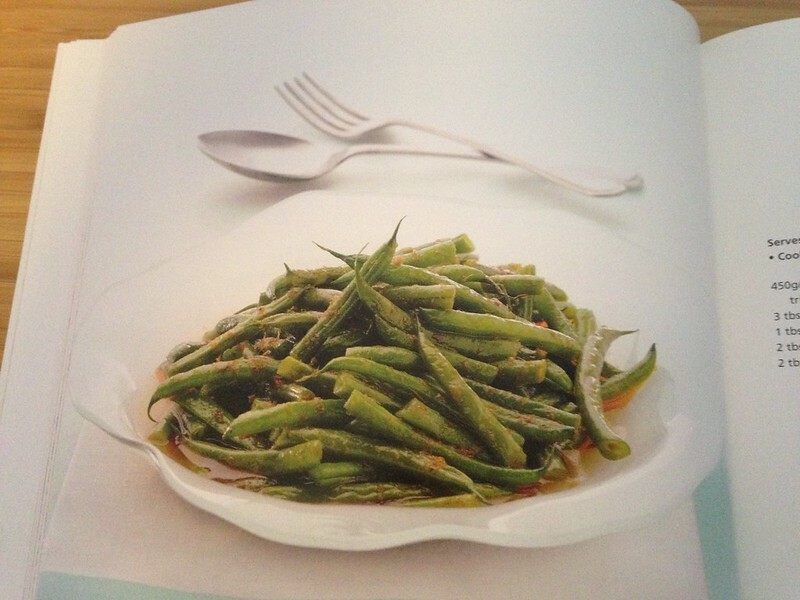 ‘Spicy Green Beans’ (or Pad Ped Tou Kag) is a simple way to dress up fresh homegrown beans to be part of a Thai meal. It uses red curry paste, and there’s a recipe for that included in the book (although of course you can cheat and use a ready made one!). I didn’t know anything at all about Sallie Morris, but a recent article in the Independent explains that Sallie is one of the food writers who spiced up British cuisine back in the 1980s, introducing us to a world of new cuisines. 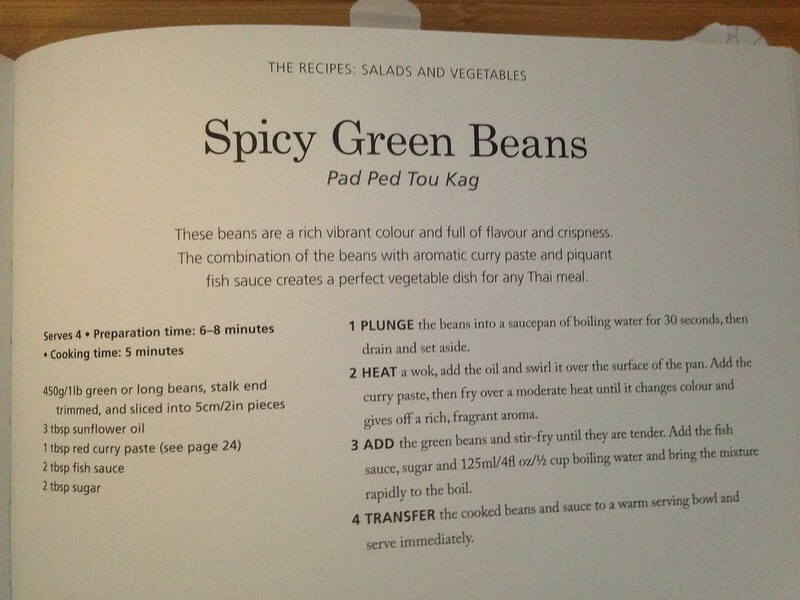 The Easy Thai Cookbook is a new addition of an old favourite, aimed firmly at people who are beginners at Thai cooking. There’s an accompanying article with more recipes from the book – Prawn and pineapple curry (Gaeng khau goong, Thai beef salad (Yum neau) and Green mango salad (Yum ma-maung) – so you can have a good try before you buy! The other recipes I have bookmarked to try are both in the desserts section. The first is a coconut milk ice cream (must make space for the ice cream maker in the freezer!) and an intriguing one called ‘Thai rubies in sweetened coconut milk’ which involves water chestnuts (!) and tapioca flour. The very back of the book has a section of menus, each of which combines a selection of recipes from the book and gives you a detailed timeline of which preparation steps need to happen when, which is a nice idea. There’s one for a simple lunch, a packed lunch, family meals of varying complexity, a date night selection and a one of party nibbles. Easy Thai Cookbook by Sallie Morris is published by Nourish books, with an RRP of £14.99. Mine were Duchy Originals seeds, but you can also get Helda beans from T&M now, too.